Let us start out by giving you a background to our program and the reasons behind its success. Western Edge Seafood started out as a fresh fish company that eventually transitioned into a purely frozen seafood company. There was one major factor that we realized in the process of making this transition from fresh to frozen seafood: In fresh, if your fish is of high grade and at the right price, brand really doesn’t come into play. However, in frozen, there is a lot more competition, and you need something to separate your product from everyone else. This is when we determined that branding is the answer. When you walk into a cold storage facility, a wholesaler's warehouse, or even a retail store, the first thing that separates one product from another to you will be the packaging. A product packaged to exude quality will be more likely to be assumed a higher-grade product before the box is even opened. Now we all know beautiful outer packaging does not always mean the product inside is of premium quality and realizing this is where we saw our opportunity. We have the premium grade product, so we simply put a box around it that drastically separated it from its competition, and sales took off. We started our frozen program with Tilapia, and expanded it using the same principle of premium product in a premium box, and have now grown our program to include Catfish, Ocean Perch, Pollock, Mahi Mahi, Swai, Cod, Haddock, Tuna, Snapper, Golden Pompano, Mediterranean Sea Bass (aka Branzino), Croaker, Crawfish, Salmon, and now Breaded Shrimp. We have built a very strong program for ourselves and our customers on this foundation, and we are now offering to our customers to take their own programs to the next level by putting Western Edge premium seafood in their own private label packaging. What separates us from a lot of other companies is that we have a professional in-house graphic design department at Western Edge that is able to work directly with you in developing your private label program. Having your own brand gives your seafood program consistency because you own and control your brand, thus allowing you to buy from multiple suppliers, thus you will be able to offer your customers one brand all the time. Having one brand all of the time provides your customers with confidence that they will be able to repeat purchase from you and receive the same product every time. The beauty of a Private Label program is that no one else has your brand. You can sell it as your own without worrying about your competition down the street undercutting you by a nickel to steal the sale away of the same product. This will also help to develop a following on your brand. The sales staff no longer has to spend time explaining a brand change. And we find that a salesperson who has success with private label in one account will put forth greater effort to build the program with his other accounts. This drives category growth. Having Western Edge as your consistent supplier on a product line(s) is beneficial because it gives you the opportunity to be more confident with your seafood program, ensuring that you are backed by a company that has a very strong Quality Control Program in place, and that your Private Label Program is monitored on a regular basis. This insures that if there are any problems, they are handled proactively. As we have demonstrated our successes with program growth, you can experience that same success with the ability to use Western Edge Seafood to expand your Private Label Program product line. This is not limited to the species that Western Edge currently carries, as we have an extremely experienced buying team with strong relationships with packers and processors around the globe, encompassing a wide variety of seafood products. Western Edge is a very detail-oriented supplier, and we will meet with you regarding your needs, and as your Private Label Program grows, we will analyze your growth and work with you to order accordingly. Once you have an established Private Label Program, you will have the ability to market your brand and products under that brand without having to worry about inconsistency in brand availability, because it will be your brand, and you will have more control on how you wish represent your product and approach selling your clientele. A Real Example. With Real Results. 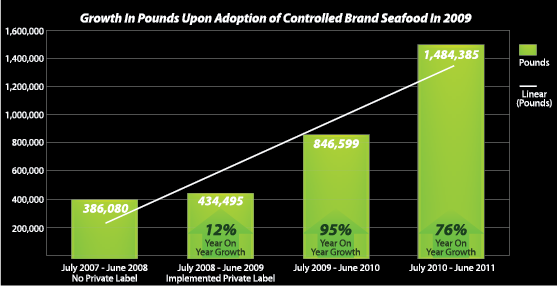 Below is a graph that is representative of real results of a Private Label program using Western Edge Seafood asa supplier. This allowed the customer to capitalize on their current product line by creating confidence in their customer base with a consistent brand and quality of product. This also gave them the ability to more easily expand their product line to include other species with a brand that is already trusted and accepted by their customer base. Having Western Edge Seafood develop a Private Label Program for you will further develop and strengthen your seafood program. This will alleviate the headaches of frantic purchases and product inconsistencies. We look forward to helping our customers to take a step in their own direction to solidify their seafood program.